Parking lot striping is a huge deal when it comes to keeping your business looking beautiful. With the growing economy in and around Houston, Texas, you will want to make sure your parking area is well maintained, safe, and inviting. You do not want your business to look outdated compared to some of the new construction coming into the area, so giving your parking lot a face lift is a great way to have a fresh start. Making that first impression for your customer or visitor occurs before they ever walk through the doors of your actual business. The moment they drive onto your property, they will notice if the parking area is clearly marked, and this will leave that first impression either good or bad. 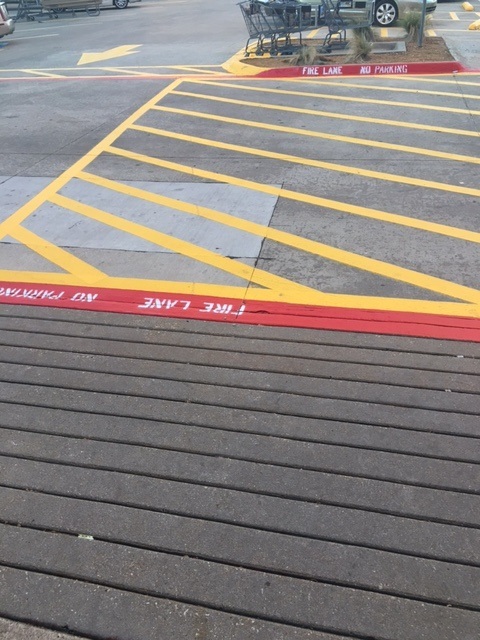 Not only does a freshly striped parking area show the visitor that you take pride in your business, it also shows that you take pride in your customer’s safety as well. When the parking lot is clearly marked, traffic flow will be consistent, vehicles will be less likely to incur damage if parked properly in the space marked, and speed bumps will slow traffic on the lot. Also having proper signage in the parking lot, such as handicap signs, fire lanes, no parking zones, and loading zones, lets the visitors know areas that may be restricted. There is so much going on out in the parking lot that you may have never thought of before. We are the number one choice for asphalt striping and pavement markings, in and around Houston. We have been striping parking lots in the Houston area for over 12 years and we would love to become your go-to company for all parking lot maintenance. We service both new lot construction as well as restripes for existing businesses. We know you have a choice when it comes to selecting a company to help with your parking lot maintenance needs. We hope we can earn your business. We will work directly with your management team, project managers, business owner, general contractors or anyone you indicate as in charge of this project, to ensure we do not disrupt your normal flow of business. We work on your schedule which should bring some peace-of-mind to you as to our level of commitment to serving you and as well as your customers. Providing professional parking lot striping services is our passion. We specialize in the following services that will ensure your lot has a long lasting and nice fresh appearance. A freshly striped parking lot makes your business look so professional and inviting. It also keeps you compliant with fire codes and ADA regulations. Since going into effect in 1990, The American Disabilities Act (ADA) requires that every business stay compliant with regulations that have been put in place to protect people with a handicap. In order to stay compliant, each parking lot must have a mandatory amount of handicap accessible parking spaces available to their patrons based on the number of parking spaces in each 1,000 sq. ft. of utilized parking space in the parking lot. Depending on the size of the parking lot, you may also be required to have a designated handicap van accessible area as well. Our team is fully aware of all of the compliance regulations and will make sure that your parking lot stays compliant. There is no need for you to try and understand the rules and regulations, as we have got you covered. We can help you with all signage to indicate the handicap parking areas, both metal signs, as well as parking lot striping stencils for ADA Compliance. For everyone’s safety having clearly marked fire lanes is imperative. Not only is having your fire lanes clearly marked imperative, but it is also a requirement. 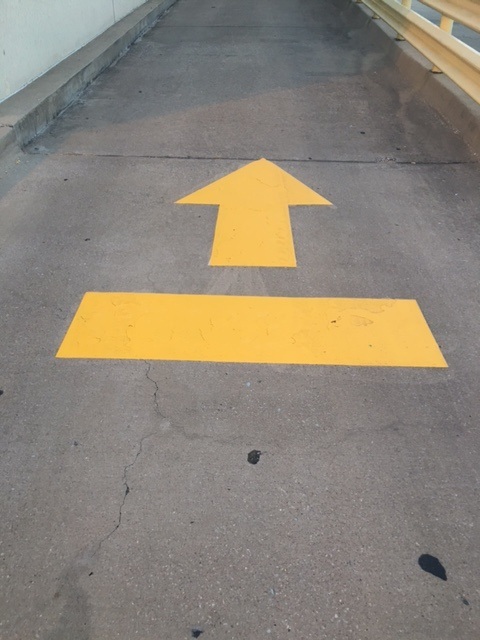 City codes spell out the exact requirements for how your fire lanes should be marked, and we know all of the codes to keep you compliant. One thing you do not want to happen is to receive a visit from the local Fire Marshall indicating that you are not compliant. We can ensure you that your lot will be compliant as we know and understand all of the city requirements for all cities and suburbs all across the Houston Metropolitan Tri-County Area. Wheel stops are typically made from reinforced concrete, rubber or plastic. We are experts at installing new wheel stops, or removing and disposing of damaged wheels stops, or wheel stops you may no longer want in the parking area. If you have existing concrete wheel stops, we can give a fresh new look to your stops by applying a nice coat of paint. Not only does the fresh coat of paint provide a great look, it also helps with safety issues. When your visitors can see the wheel stops, there will be less likely a chance that people will trip over the wheel stops while walking from the parking area to the actual building. Wheel stops are a cheaper alternative to installing an actual curb. The stops help prevent vehicles from causing damage to parking structures, buildings, walls, and other vehicles. They can also prevent drivers from driving onto a sidewalk. The speed bumps main function is to help control vehicle speed. Speed bumps are also the most effective way to improve safety in a parking lot by controlling the speed of the vehicles in your lot. Pedestrian’s safety while on your lot is important, and controlling the speed of vehicles in the lot is very important. We are experts at installing all types of speed bumps. Similar to wheels stops, speed bumps can be made out of concrete, asphalt, rubber, or plastic. Keeping the speed bumps highly visible will prevent both pedestrian traffic incidents due to tripping at a minimum, and will also prevent vehicle damage from hitting the speed bump without seeing it. We pride ourselves on having received the best training and knowledge of parking lot striping techniques. We make it a priority to stay up-to-date on cutting edge technologies, and we employ the best methods available to date regarding parking lot striping. This knowledge and experience allows us to provide the best solutions to all of our clients. No matter if your parking area needs to be re-striped, or if you have a brand new parking lot, we are here to assists. We paint straight and consistent lines both in color, as well as width. This is an important aspect as there are many parking lot striping companies that may not provide consistency resulting in your parking lot being sub-par to your competition. We want your business to stand out, and we also want you to love us so much that you refer all of your business friends to us as well. Houston, TX and the surrounding suburbs is chock full of all types of businesses and we actually can service them all. We work with any business that may have a parking lot. We would love to add your company to our portfolio, and provide you with top-notch professional striping services. If your type of business is not listed in the above examples, never fear. Reach out to us by calling today and we will add you to our list. We look forward to servicing you and striping your parking lot. Proper signs in your parking lot will help your visitors know how to follow the rules. No matter the type of signs needed we can assist.